Jerry Andrus’ Omni Deck has returned! 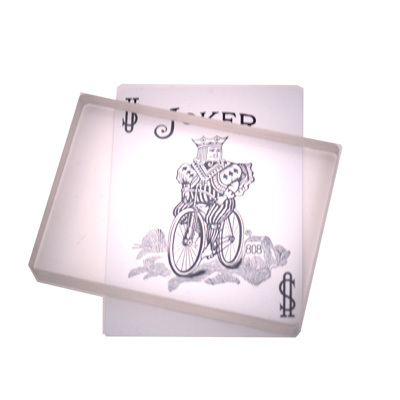 The effect is simple: after an Ambitious Card routine, the deck all of a sudden turns to a solid, see-through piece of Perspex. It’s a weird illusion and looks great! I’ve seen people scream when they see the deck change to a see-through block and I think you will too. The Omni Deck comes complete with easy-to-follow instructions for a basic Ambitious Card routine, making use of the gimmick. Chances are that once you get comfortable with it, you’ll want to experiment and come up with your own routine. The deck is well made and will last you a lifetime. That’s a whole lifetime of screams and gasps that you’ve got ahead of you – quite an investment!